Lenovo ThinkAgile SX for Microsoft Azure Stack delivers a pre-integrated, easy-to-deploy rack-level solution for hybrid cloud to dramatically reduce time-to-value and total cost of ownership (TCO). The solution is based on Lenovo's industry-leading data center infrastructure and Microsoft Azure Stack, an extension of Microsoft Azure Services to on-premises environments. This product guide provides essential technical and pre-sale information on the ThinkAgile SX for Microsoft Azure Stack models SXM4400 and SXM6400, their key features and specifications, components and options, and configuration guidelines. This guide is intended for technical specialists, sales specialists, sales engineers, IT architects, and other IT professionals who want to learn more about the ThinkAgile SX for Microsoft Azure Stack and consider its use in IT solutions. This Product Guide describes models of the ThinkAgile SX for Azure Stack that are based on the Lenovo ThinkSystem SR630 and SR650 servers featuring the Intel Xeon Processor Scalable Family. For models of the ThinkAgile SX for Azure Stack that are based on the Lenovo System x3550 M5 and x3650 M5 servers featuring the Intel Xeon processor E5-2600 v4 product family, see the Lenovo ThinkAgile SX for Microsoft Azure Stack (SXM4200, SXM6200) Product Guide. Suggested workloads for the ThinkAgile SX for Microsoft Azure Stack include virtual desktop infrastructure (VDI), back-office applications, server consolidation, enterprise applications, databases, test and development environments, and cloud implementation. Starting with as few as four nodes to keep your acquisition costs down, the solution offers “pay as you grow” scalability as your needs grow. The ThinkAgile SX for Microsoft Azure Stack ships fully integrated into a rack cabinet, tested, configured, and ready to be plugged in and turned on; it is designed to integrate into an existing infrastructure effortlessly, to dramatically accelerate time to value and reduce infrastructure maintenance costs. There is no up-front cloud software license acquisition cost for the ThinkAgile SX for Microsoft Azure Stack, monthly billing is based on the actual resource usage (capacity-based licenses are also available). Lenovo provides ThinkAgile Advantage Single Point of Support for the entire ThinkAgile solution with the nodes, networking, and software, for quicker problem determination and minimized downtime. Lenovo ThinkAgile SX for Microsoft Azure Stack integrates computing, storage, networking, and management, and it is designed with industry-standard building blocks, including hyperconverged nodes that are built on powerful and highly reliable Lenovo ThinkSystem servers, RackSwitch networking, and Azure Stack software that extends Azure technologies on-premises. The ThinkAgile SX for Microsoft Azure Stack includes the ThinkAgile SXM4400 25U model that can be scaled from 4 to 8 nodes, the ThinkAgile SXM4400 42U model that can be scaled from 4 to 16 nodes, and the ThinkAgile SXM6400 model that ships with 16 nodes. The ThinkAgile SX for Microsoft Azure Stack can also be deployed in a customer-provided rack cabinet with scaling from 4 to 16 nodes. Scalable ThinkAgile SX for Microsoft Azure Stack configurations of an on-premises, hyperconverged, hybrid cloud platform designed to optimize workload performance and provide the IT agility for business demands. Flexible monthly billing that is based on actual resource usage helps lower acquisition cost for the entire solution by eliminating upfront cloud software licensing fees. Factory-integrated, pre-configured ready-to-go solutions that are delivered in a Lenovo rack cabinet or can be installed in a customer-provided rack cabinet, with all the hardware customers need for their workloads: servers, storage, and network switches, plus Azure Stack cloud software and Lenovo XClarity hardware management tools. Lenovo deployment services that are included with the solution help get customers up and running quickly. Proven and reliable Lenovo ThinkSystem servers featuring Intel Xeon Scalable Processors provide compute power for a variety of workloads and applications. Lenovo ThinkSystem Ethernet switches deliver exceptional performance and low latency, along with cost savings, and are designed to perform seamlessly with other vendors' upstream switches. Microsoft Azure Stack provides a scalable, highly available solution for hybrid cloud extension to deliver Microsoft Azure cloud services on-premises with integrated compute, networking, storage, security, and management services that manage VM lifecycle and automate and orchestrate workload provisioning. Microsoft Storage Spaces Direct (S2D), an integrated part of the Azure Stack solution, delivers scalable, highly available distributed shared storage that provides extensive data protection and recovery with no performance bottlenecks and no single point of failure. Powerful tools to manage both hardware and applications that come with the ThinkAgile SX for Microsoft Azure Stack simplify and automate the management of the entire cloud solution, allowing customers to manage the infrastructure as a single system, rather than as individual components. Lenovo ThinkAgile Advantage provides a single point of contact for all support issues that customers might encounter with the server, networking, storage, and software used in the solution, for quicker problem determination and minimized downtime. One ThinkSystem SR630 management node. 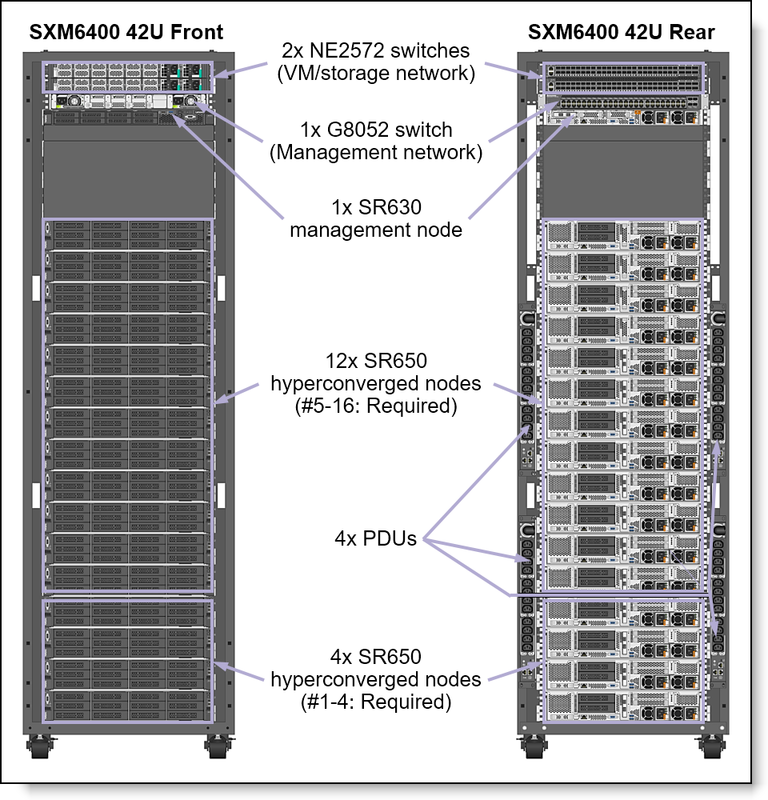 Hybrid storage: From 4 to 8 (SXM4400 25U), or from 4 to 16 (SXM4400 42U or customer-provided rack cabinet), or 16 (SXM6400). All flash storage: From 4 to 8 (SXM4400 25U, SXM4400 42U, or customer-provided rack cabinet), or 8 (SXM6400). One RackSwitch G8052 1 GbE management network switch. Two ThinkSystem NE2572 RackSwitch 25 GbE VM/storage network switches. Lenovo XClarity VM: Provides hardware management services. Windows Server 2016 with Hyper-V.
Azure Stack software: Provides scalable hybrid cloud platform. Storage Spaces Direct (S2D): Provides highly available, scale-out storage for the cloud workloads. Network connectivity is provided by the Lenovo RackSwitch switches. The management network consists of one G8052 1 GbE switch that runs Enterprise Network Operating System (ENOS), and the VM/storage network consists of two NE2572 25 GbE switches that run Cloud Network Operating System (CNOS). The front and rear views of the ThinkAgile SXM4400 25U are shown in the following figure. The front and rear views of the ThinkAgile SXM4400 42U are shown in the following figure. Note: The maximum quantity of the all flash nodes in the SXM4400 is limited to 8. The front and rear views of the ThinkAgile SXM6400 are shown in the following figure. 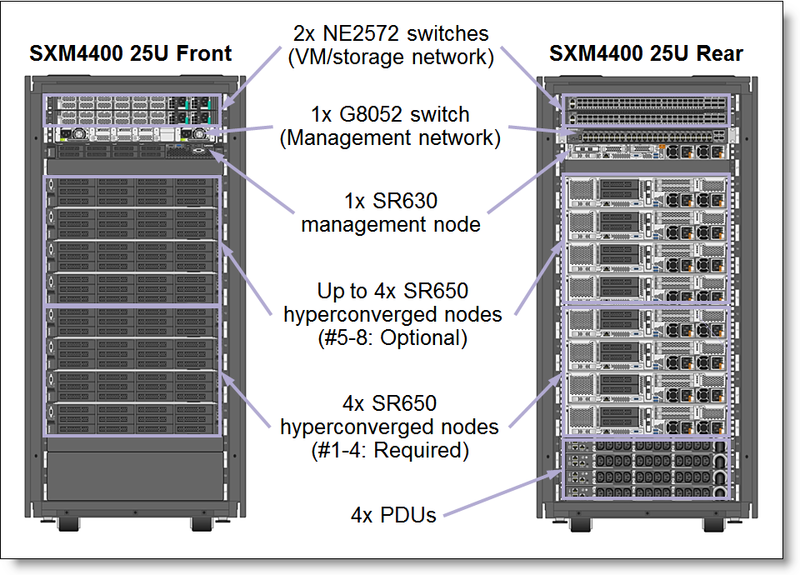 Note: The maximum quantity of the all flash nodes in the SXM6400 is limited to 8. The following table lists the system specifications of the ThinkAgile SX for Microsoft Azure Stack. All PDUs in a rack cabinet should be of the same type. IEC 320-C13 to C14 AC power cables for connecting all the equipment in a rack cabinet to PDUs are included. Hardware warranty Three-, four, or five-year customer-replaceable unit and onsite limited warranty with ThinkAgile Advantage Support and selectable service levels: 9x5 next business day (NBD) parts delivered, 24x7x4, or 24x7x2 response (parts delivered or onsite) or 6-hour or 24-hour committed repair (select countries). Also available are 1-year and 2-year post-warranty extensions, Your Drive Your Data and Premier Support. Software Microsoft Windows Server 2016 with Hyper-V, Microsoft Storage Spaces Direct, Microsoft Azure Stack, Lenovo XClarity Administrator with XClarity Pro. Processor Two Intel Xeon Bronze 3106 processors. Memory 64 GB (8x 8 GB TruDDR4 RDIMMs). ECC, patrol scrubbing, and demand scrubbing memory protection. Drive bays 8x 2.5-inch SAS/SATA hot-swap. Internal storage 2x 2.5" 800 GB Enterprise Performance 12 Gbps SAS SSDs (RAID-1 boot volume). Storage controller 1x RAID 530-8i (12 Gbps SAS). One dual-port 25 GbE SFP28 adapter (Mellanox ConnectX-4 Lx) (one port is connected to the management network switch with one 1m SFP+ DAC cable included). 1x 1 GbE dedicated XCC management port (RJ-45) connected to the management network switch with one UTP Category 5E cable included. Front: 1x USB 2.0 port with XClarity Controller access, 1x USB 3.0 port. Rear: 2x USB 3.0 ports and 1x DB-15 VGA port. Management features Lenovo XClarity Controller (XCC) Enterprise (Pilot 4 chip), proactive platform alerts, light path diagnostics, Lenovo XClarity Administrator with Pro license. Cooling Seven hot-swap system fans with N+1 redundancy. Power supplies Two redundant hot-swap 550 W High Efficiency Platinum AC power supplies. Processor Two Intel Xeon Gold or Platinum processors. Memory 24 DIMM sockets with support for 16 GB or 32 GB TruDDR4 RDIMMs, or 64 GB TruDDR4 LRDMMs. Memory speed up to 2666 MHz. ECC, SDDC (for x4-based memory DIMMs), ADDDC (for x4-based memory DIMMs), patrol scrubbing, and demand scrubbing memory protection technologies. Drive bays 14x 3.5-inch hot-swap: 14x SAS/SATA or 10x SAS/SATA + 4x NVMe PCIe. 10x 12TB 7.2K 6Gb NL SATA 3.5" HS 512e HDDs. 1x M.2 Kit with Mirroring for boot volume. 1x 430-16i HBA (12 Gbps SAS/6 Gbps SATA) for Storage Spaces Direct. One dual-port 25 GbE SFP28 adapter (Mellanox ConnectX-4 Lx) connected to the VM/storage network switches with two SFP28 DAC cable included. Rear: 2x USB 3.0 ports and 1x VGA port. Power supplies Two redundant hot-swap 1100 W High Efficiency Platinum AC power supplies. Memory 24 DIMM sockets with support for 16 GB or 32 GB TruDDR4 RDIMMs or 64 GB TruDDR4 LRDMMs. Memory speed up to 2666 MHz. ECC, SDDC (for x4-based memory DIMMs), ADDDC (for x4-based memory DIMMs), patrol scrubbing, and demand scrubbing memory protection technologies. Drive bays 24x 2.5-inch hot-swap: 20x SAS/SATA + 4x NVMe PCIe. 20x S4510 1.92TB Entry SATA 6Gb Hot Swap SSDs. 20x S4500/S4510 3.84TB Entry SATA 6Gb Hot Swap SSDs. 3x 430-8i HBAs (12 Gbps SAS/6 Gbps SATA) for Storage Spaces Direct. One dual-port or two single-port 25 GbE SFP28 adapters (Mellanox ConnectX-4 Lx) connected to the VM/storage network switches with two SFP28 DAC cable included. Management network 1x RackSwitch G8052 Gigabit Ethernet switch (7159-HCH) with 48x 1 GbE RJ-45 ports and 4x SFP/SFP+ uplink ports. VM/storage network 2x RackSwitch NE2572 25 Gb Ethernet switches (7159-HEA), each with 48x 25 GbE SFP28/SFP+ and 6x 100 GbE QSFP28/QSFP+ ports. VM network uplinks 4x 10 GbE SFP+ SR or 4x 25 GbE SFP28 SR upstream VLAG connections (2x per NE2572) with customer-supplied MMF OM3 or OM4 fiber optic cables with LC connectors. NE2572: 1x 10/100/1000 Mb Ethernet. Layer 2 and Layer 3 switching, VLANs, VLAN tagging, spanning tree, link aggregation, virtual link aggregation, VRRP, QoS, CEE, IP v4/v6 management and routing. G8052: Three N+1 redundant hot-swap fans. NE2572: Five N+1 redundant hot-swap fans. G8052: Two redundant hot-swap 450 W AC. NE2572: Two redundant hot-swap 770 W AC. * For customer-provided rack cabinets, the Form factor, Dimensions, Total rack load capacity, Maximum rack weight, and AC power distribution attributes do not apply. Note: You are required to engage a Lenovo representative in the project that includes the ThinkAgile SX for Microsoft Azure Stack. 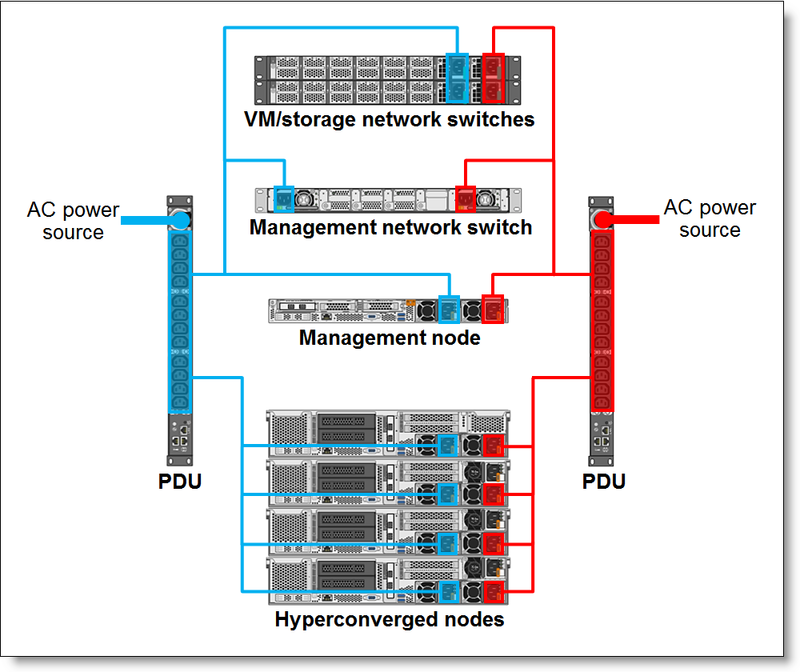 Note: The type and configuration of all hyperconverged nodes must be the same. The ThinkAgile SX for Microsoft Azure Stack is designed for installation in a rack cabinet. The SXM4400 and SXM4600 models are factory-integrated and delivered in a rack cabinet. A rack cabinet for mounting the ThinkAgile SX for Microsoft Azure Stack components can also be provided by the customer. Lenovo deployments services are included; they provide remote preparation and planning, configuring platform components, validating installation, transferring knowledge, and developing post-installation documentation. Lenovo basic installation services are optional; they provide mounting the components in a customer-provided rack cabinet, connecting components to network and electrical power, checking and updating firmware, verifying operations, and disposal of the packaging materials within the customer site. The existing ThinkAgile SX for Microsoft Azure Stack deployments can be expanded up to the maximum number of hyperconverged nodes supported by ordering the expansion node models. Field expansion is handled by Lenovo professional services via a service contract. Note: The configuration of the expansion nodes must be the same as for the existing base nodes. The following table lists the base models of the ThinkAgile SX for Microsoft Azure Stack rack cabinets. Configuration note: For SXM4400 and SXM4600 models, 1U, 3U, and 5U Filler panels are derived based on the number of nodes selected. Power distribution units (PDUs) are used to distribute power from an uninterruptible power supply (UPS) or utility power to the equipment within the ThinkAgile SX for Microsoft Azure Stack rack cabinet (SXM4400 or SXM6400) and to provide fault-tolerant power redundancy for high availability. Each node, management network switch, and VM/storage network switch has two redundant power supplies, and each of two power supplies is connected to a separate PDU to support topologies with redundant AC power sources. The following table lists the power distribution units for the ThinkAgile SX for Microsoft Azure Stack rack cabinets. Only one type of PDUs is supported within the ThinkAgile SX for Microsoft Azure Stack rack cabinet; different PDU types cannot be mixed within the rack cabinet. Power cables are derived based on the ThinkAgile SX for Microsoft Azure Stack model and the number of nodes selected. The ThinkAgile SX for Microsoft Azure Stack uses the Lenovo ThinkSystem SR630 server as a management node. The SR630 is a density-optimized, 1U dual-socket server that offers outstanding uptime to keep cloud deployments running safely and comprehensive systems management tools that help make deployment easier. Outstanding reliability, availability, and serviceability (RAS) and high-efficiency design improve your business environment and help save operational costs. The following table lists the base configuration of the ThinkSystem SR630 for ThinkAgile SXM that is derived. The SR630 for ThinkAgile SXM requires two Intel Xeon Bronze 3106 8C 85W 1.7GHz processors. The following table lists the specifications of the processors for the SR630 for ThinkAgile SXM. The following table lists feature codes of the derived processors. The SR630 for ThinkAgile SXM supports 64 GB of memory with 8x 8 GB (1Rx8) 2666 MHz TruDDR4 RDIMMs. Each processor has six memory channels, and there is one DIMM per channel installed in four channels, and the remaining two channels remain unpopulated. The operating memory speed is up to 2133 MHz. The following table lists memory RDIMMs derived for the SR630 for ThinkAgile SXM. The SR630 management node has 8x 2.5" hot-swap drive bays connected to the ThinkSystem RAID 530-8i PCIe 12Gb Adapter. The following table lists the internal drive configuration for the management node. The following table lists the SSDs derived for the SR630 management node. For the management network, the SR630 for ThinkAgile SXM uses 25 GbE connectivity with the dual-port 25 GbE Mellanox ConnectX-4 Lx network adapter: One port that operates at 10 Gbps is connected to the management switch via the 10 GbE link. Also, the 1 GbE dedicated management port on the XCC is connected to the management network switch. For more information, refer to Networking. The following table lists the network adapter derived for the management node. Configuration note: The 1.5 m UTP Cat5e cable (1 GbE) and 1 m 10 GbE SFP+ DAC cable for the management network connections are included. The ThinkAgile SX for Microsoft Azure Stack uses the Lenovo ThinkSystem SR650 servers as hyperconverged nodes. The SR650 is a versatile 2U dual-socket server that offers outstanding uptime to keep cloud deployments running safely and comprehensive systems management tools that help make deployment easier. Outstanding reliability, availability, and serviceability (RAS) and high-efficiency design improve your business environment and help save operational costs. The following table lists the base configuration of the ThinkSystem SR650 for ThinkAgile SXM. * Processor model is selectable (See Processors for details). ** Memory capacity is configurable (See Memory for details). *** Drive capacity is configurable (See Internal storage for details). The SR650 for ThinkAgile SXM requires two Intel Xeon Gold or Platinum processors. The following table lists the specifications of the processors for the SR650 for ThinkAgile SXM. The following table lists feature codes of the supported processors that are available for selection. The SR650 for ThinkAgile SXM supports up to 1.5 TB of memory with 24x TruDDR4 DIMMs. Each processor has six memory channels, and there are two DIMMs per channel. All DIMMs in the system operate at the same memory speed up to 2666 MHz. Adaptive Double Device Data Correction (ADDDC) works with x4-based memory DIMMs and requires the Closed Page memory access mode. The following table lists memory selection options available for the SR650 for ThinkAgile SXM. The SR650 hyperconverged node for hybrid storage has 14x 3.5" hot-swap drive bays (12 on the front; 2 on the rear) connected to the ThinkSystem 430-16i SAS/SATA HBA (JBOD mode), and an internal M.2 Kit with Mirroring for 2x M.2 non-hot-swap SSDs. The SR650 hyperconverged node for all flash storage has 24x 2.5" hot-swap drive bays connected to three ThinkSystem 430-8i SAS/SATA HBAs (JBOD mode), and an internal M.2 Kit with Mirroring for 2x M.2 non-hot-swap SSDs. For the boot volume, the hyperconverged nodes use 2x M.2 5100 480GB SSDs installed in the M.2 Kit with Mirroring. The drives are configured in a RAID-1 group that provides highly available boot volume for the system software. The following table lists the internal drive configuration for the data storage of the hyperconverged nodes. The following table lists the internal drive configurations for the boot volume of the hyperconverged nodes. The following table lists the HDD and SSD selection options for the SR650 hyperconverged nodes for hybrid and all flash storage. The following table lists the SSDs derived for the boot volume of the SR650 hyperconverged nodes. For the management network, the SR650 for ThinkAgile SXM uses 1 GbE connectivity with the 1 GbE dedicated management port on the XCC that is connected to the management network switch. For the VM/storage network, the SR650 for ThinkAgile SXM provides two-port 25 GbE connectivity: Each port is connected to a separate VM/storage switch. For more information, refer to Networking. The following table lists the network adapters available for selection. Either one dual-port or two single port adapters can be selected to provide dual-port connectivity. If single-port adapters are selected, the Mellanox QSA 100G to 25G Cable Adapters are derived by the configurator to provide 25 GbE SFP28 connectivity. The 3 m UTP Cat5e cable for the 1 GbE management network connection and two 3 m passive 25 GbE SFP28 DAC cables for the VM/storage network connections are included for each hyperconverged node. The ThinkAgile SX for Microsoft Azure Stack uses one Lenovo RackSwitch G8052 1 GbE switch for management network connectivity and two Lenovo ThinkSystem NE2572 25 GbE switches for VM/storage network connectivity. 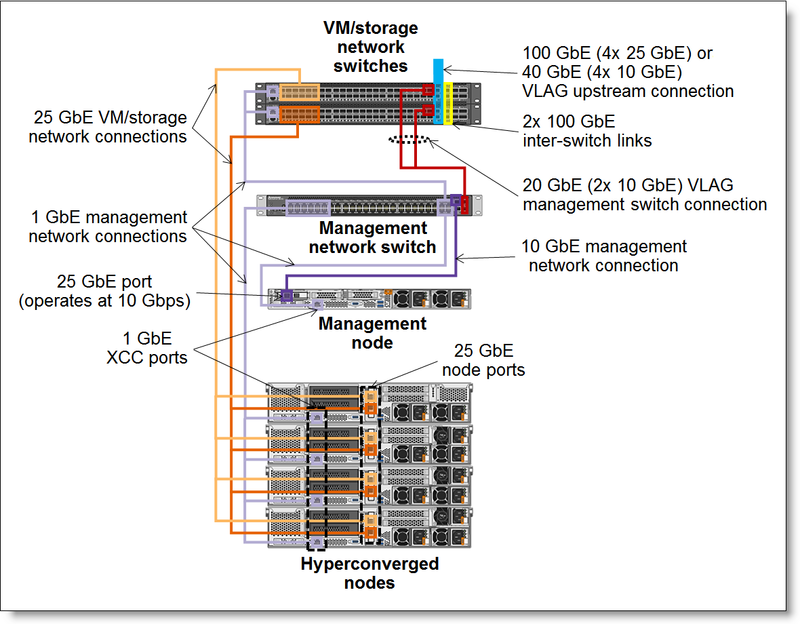 Dedicated XClarity Controller (XCC) management ports (on the management node and hyperconverged nodes) and management ports on the NE2572 VM/storage network switches are connected to the G8052 management network switch via the 1 GbE links. The management node (25 GbE port operating at 10 Gbps) also is connected to the management switch via the 10 GbE link. Two VM/storage network switches (25 GbE ports operating at 10 Gbps) are connected to the management switch via the 20 GbE virtual link aggregation group (VLAG) connection. 25 GbE hyperconverged node ports on the dual-port adapters or two single-port adapters are connected to a pair of the NE2572 VM/storage network switches. The switches are connected to each other via two 100 GbE links (provided by two 100 Gb QSFP+ active optical cables (AOCs) included) that are configured in a link aggregation group (LAG). Each of two NE2572 switches provides two 10 GbE uplinks (10 GbE SR SFP+ transceivers) or two 25 GbE uplinks (25 GbE SR SFP28 Transceiver) that are configured in a virtual link aggregation group for upstream network integration. The following table lists the derived network switches. The following table summarizes specifications of the Lenovo Ethernet switches for ThinkAgile SXM. The following table lists the transceivers that are available for the NE2572 uplink ports. All UTP Category 5E cables for the 1 GbE management network and 25 GbE SFP28 DAC cables for the VM/storage network are derived based on the number of nodes selected. VM/storage network uplinks require customer-supplied MMF OM3 or OM4 fiber optic cables with LC connectors. The optional hardware installation services are available from Lenovo Professional Services, including unpacking and inspecting the system on the customer site, connecting to power and network, verifying operation, and disposing of the packaging. The ThinkAgile SX for Microsoft Azure Stack can be configured with a three-, four, or five-year customer-replaceable unit (CRU) and onsite (for field-replaceable units [FRUs] only) limited hardware warranty with 24x7 ThinkAgile Advantage Single Point of Support (Lenovo hardware and Microsoft Azure Stack software; requires an active Azure Stack software support contract with Microsoft) and various levels of coverage with a well-defined scope of services, including service hours, response time, term of service, and service agreement terms and conditions. Lenovo’s YourDrive YourData service is a multi-drive retention offering that ensures your data is always under your control, regardless of the number of drives that are installed in your Lenovo system. In the unlikely event of a drive failure, you retain possession of your drive while Lenovo replaces the failed drive part. Your data stays safely on your premises, in your hands. The YourDrive YourData service can be purchased in convenient bundles with Foundation, Essential, or Advanced Service upgrades and extensions. A Microsoft Azure Stack subscription and software support contract for ThinkAgile SX for Microsoft Azure Stack should be obtained from Microsoft by the customer. Active Directory®, Azure®, Hyper-V®, Microsoft®, Windows Server®, and Windows® are trademarks of Microsoft Corporation in the United States, other countries, or both.